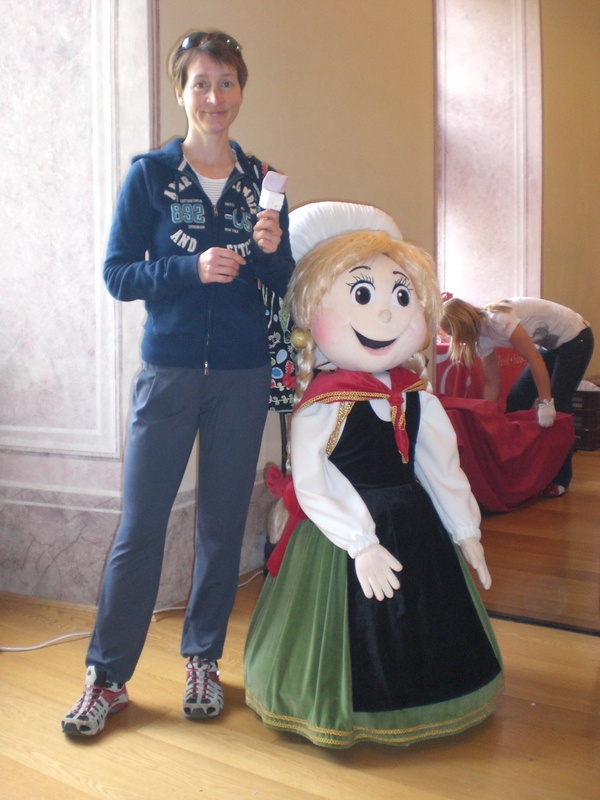 Prior to coming to live in Slovenia, my life could have been described as somewhat nomadic. As a child there were frequent moves from country to country and from home to home, and this trend continued into adulthood. I have always enjoyed travelling, new experiences and wholeheartedly believe in broadening one’s horizons. However, I must admit that since finding Slovenia, and my adopted home town of Radovljica, where I have now been for 7 years (a record for me), the travel bug has somewhat abated; partly due to financial constraints but also largely due to the fact that I no longer feel that burning urge to travel to pastures new as Slovenia has so much to offer, most of which is right here on my doorstep. 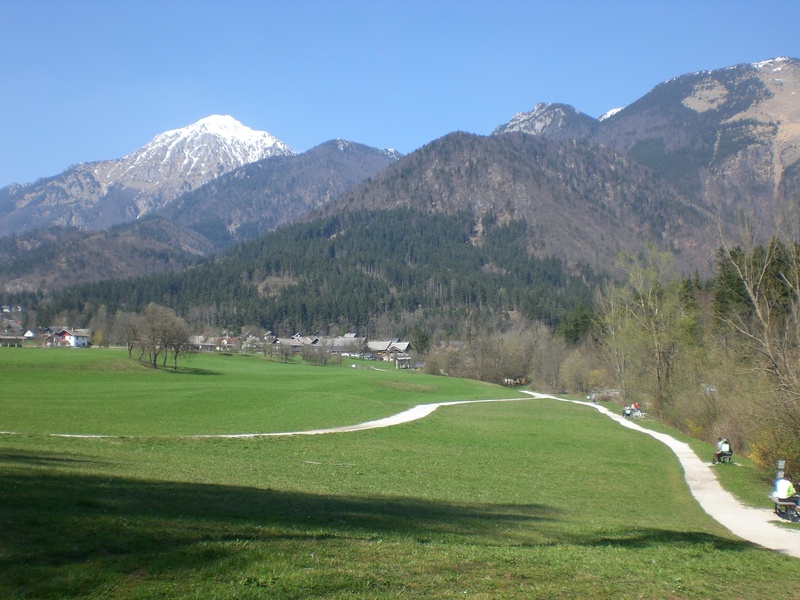 Therefore, these days I rarely feel the need to travel far from Radovljica and the surrounding areas of the Julian Alps, the Karavanke range, Bled, Kranjska Gora, Pokljuka etc. If I do, I can either make the short 2 hour flight to the UK to visit friends or family or just jump in the car and drive for a day out to the Slovene coast, the Soča Valley, or even to neighbouring Austria, Italy or Croatia. One such trip I like to make is to the annual ‘Pohod po ponoru reke Reke’ (Walk beside the Sinkhole of the river River) – note: this isn’t a typo, the name of the river really is ‘The river River’! 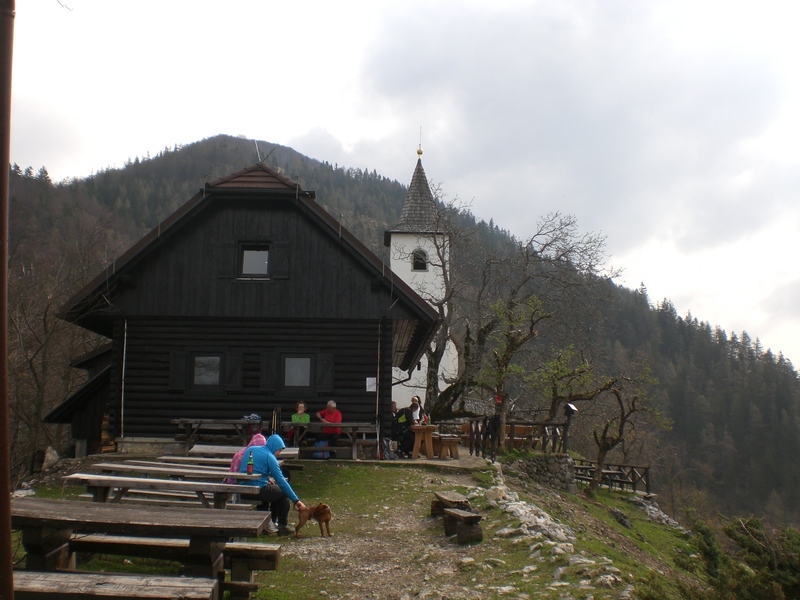 The walk, which is organised every April by the local Škocjan Tourist Association, begins in the village of Matavun, near Škocjan. From Radovljica, on a quiet Sunday morning, it took about 1hr 15mins to drive there. There is a symbolic 2 euro start fee which covers the organisation, a quick slurp of schnapps at the start and tea and/or another slurp of schnapps and refreshments en-route. 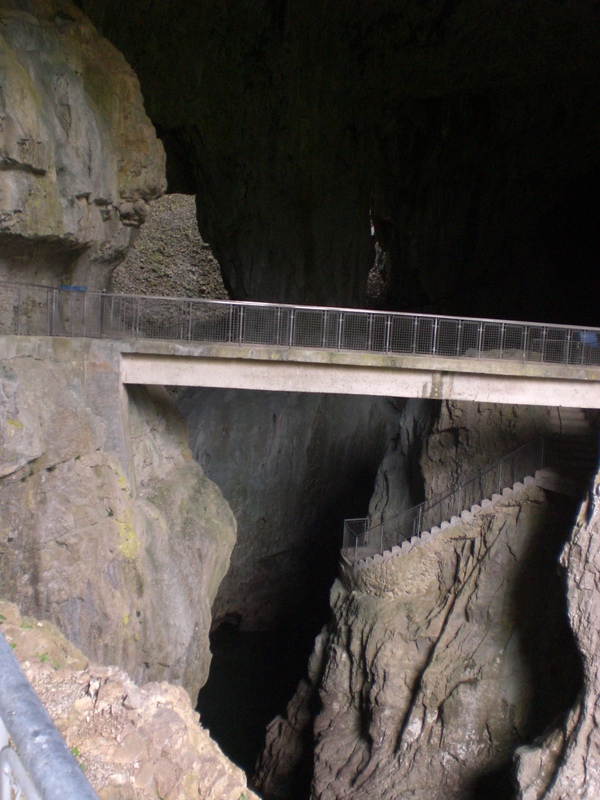 Though the annual walk doesn’t lead through the entire cave system, it does offer a glimpse into this mysterious and fascinating underground world, whilst also passing through some delightful and diverse scenery in the surrounding areas before reaching the Škocjan Cave Park and ending at the village of Škocjan. 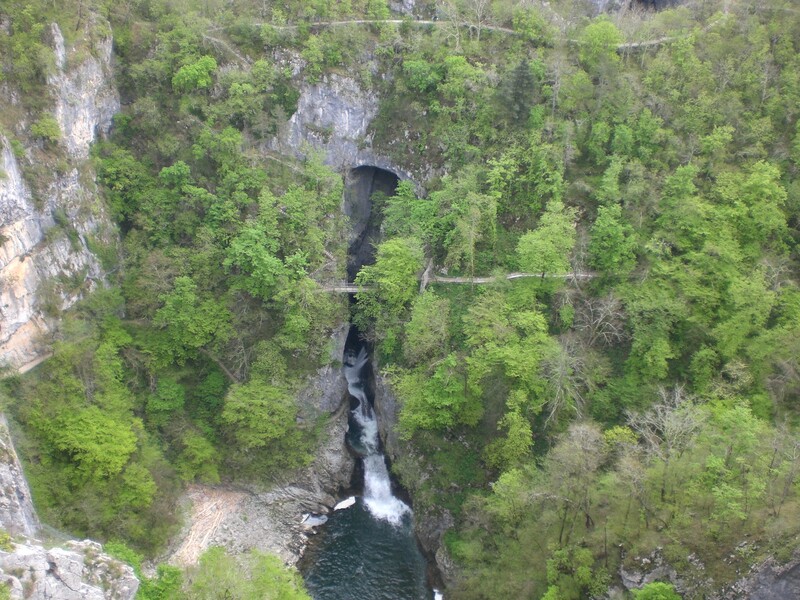 The terrain is varied; some level walking but also a fair few inclines but nothing of great significance and it is therefore suitable for all ages and abilities. 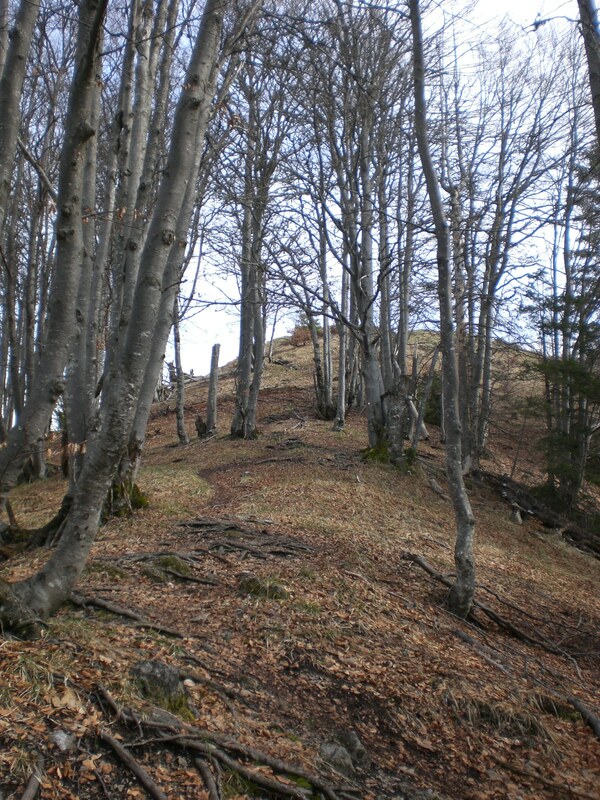 The walk takes around 3-4 hours and also passes the ruins of Školj Castle and includes a visit to St. Helen’s Church in the village of Gradišče, known for its frescoes, painted by Jean de Kastav, who also painted the much admired ‘Dance of Death’ frescoes in the Church of the Holy Trinity (Cerkev Sveta Trojica) in Hrastovlje. This week its school holidays here and also two public May Day holidays on the 1st and 2nd of May. On the eve before the 1st May holidays, it is a tradition in Slovenia to hold bonfire parties, known as ‘kresovanje’. Most towns and some villages have a bonfire – either somewhere in the town or many are also held atop a hill or at mountain huts and people gather in their masses to socialise and raise a glass (or two) beside the bonfires. In Radovljica, the bonfire party is always held next to the SPAR supermarket, at the entrance to the town, and is accompanied by live music. One of the biggest events is held on the Rožnik hill in Ljubljana, which up to 40,000 people attend. 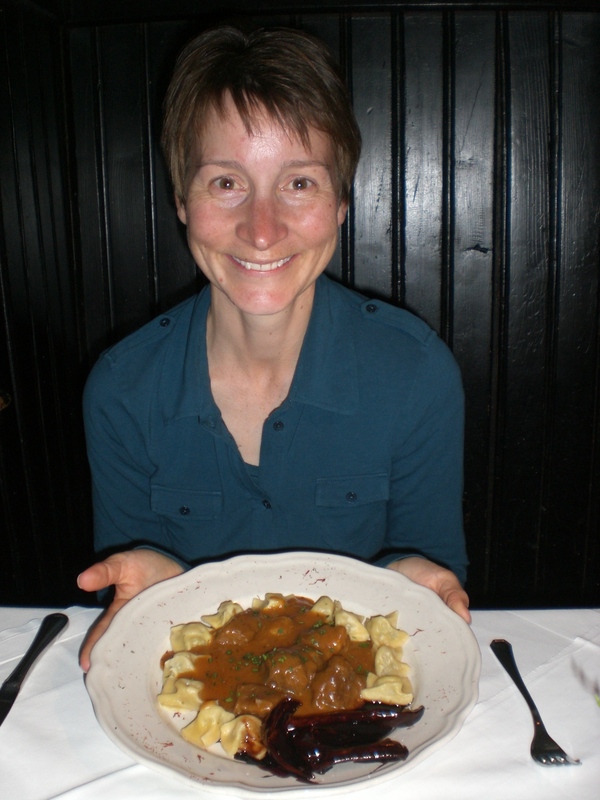 In my personal quest to help promote Radovljica’s great restaurants and ‘Taste Radol’ca‘, and having already written about three of the seven restaurants involved, last week I turned my attention to another – Gostilna Kunstelj – (http://www.kunstelj.si/). 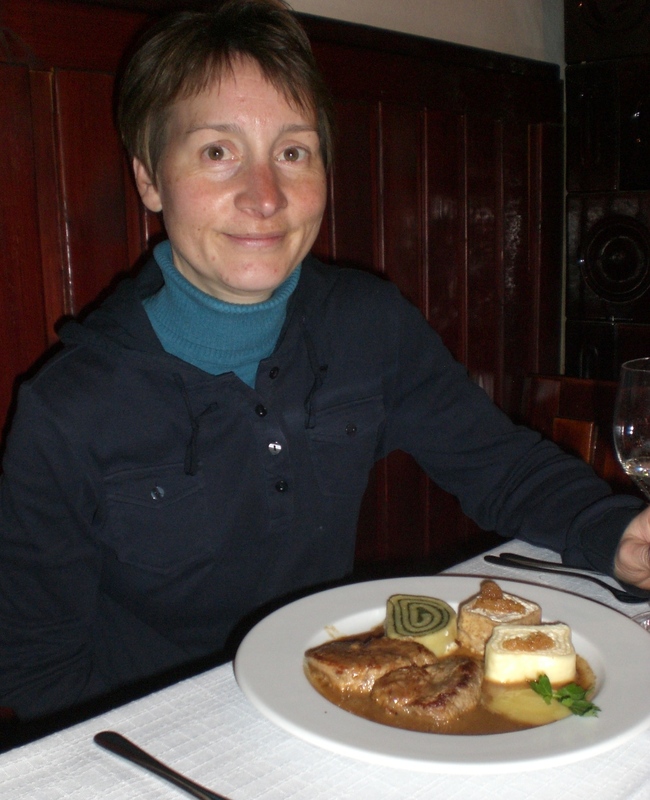 I had already visited the restaurant previously to attend a birthday/anniversary celebration, which began in the wine cellar, for the obligatory schnapps and other aperitifs, followed by dinner and live music in one of the halls, as well as having attended the launch event of Taste Radol’ca here too (more about that can be read here – https://adeleinslovenia.wordpress.com/2013/11/17/radolca-taste-the-best/ ). However, until recently I hadn’t ever actually been just for a regular meal. Now however, I’ve been twice in as many weeks – once for ‘Restaurant Week’ and, since it was offering a special chocolated-themed menu to coincide with last weekend’s Chocolate Festival, well, it would have been rude not to…..! The family run restaurant, located just a few metres from the entrance to Radovljica’s medieval old town, has been in operation since 1873 and still retains the name dating back to its first owner, Rudolf Kunstelj. It later changed hands before the Stiherle family took ownership in 1926 and today the restaurant is still run by the fourth generation of the family. 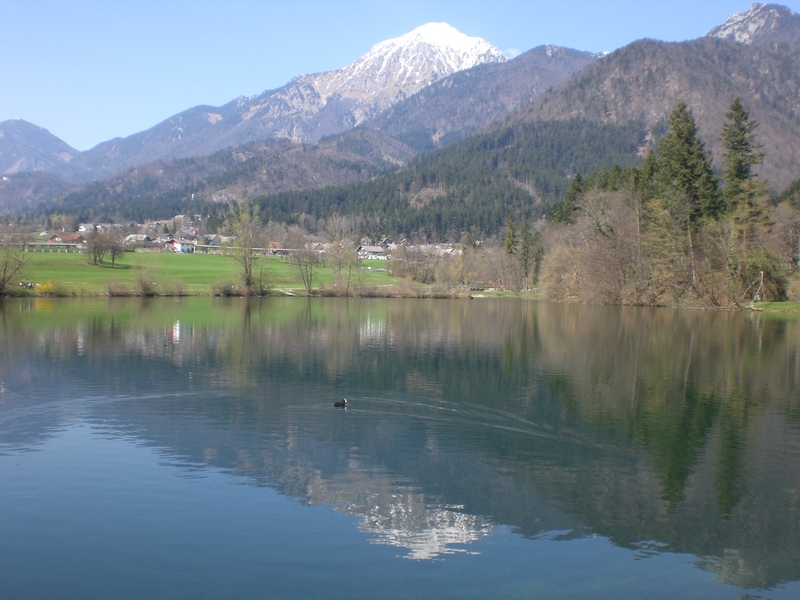 Gostilna Kunstelj is ideally located within just a few minutes walk of the train and bus stations. Its position affords marvellous views towards the Jelovica Plateau and the Julian Alps, with Slovenia’s highest mountain, Mount Triglav, dominating the skyline. In my seven years of living here, I cannot fail to still admire the view on a daily basis, and I hope that I never will. 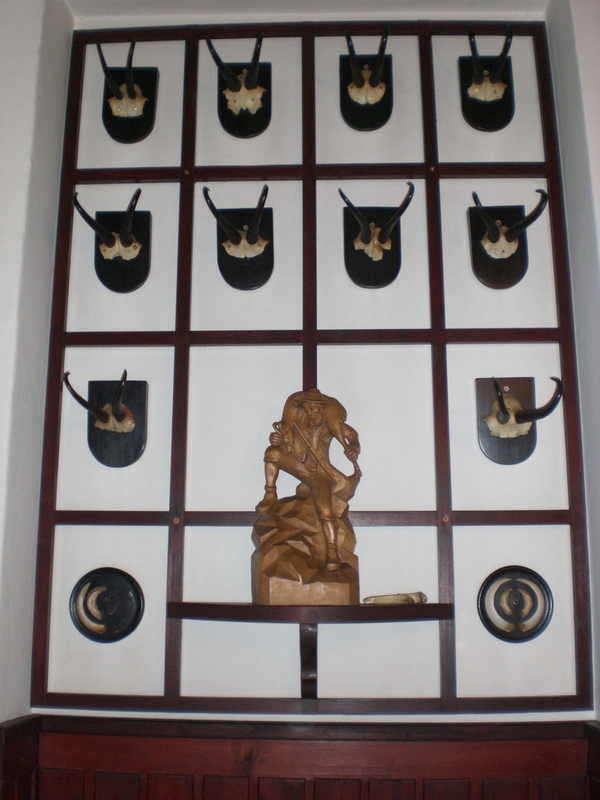 The place is huge, with lots of different cosy rooms such as the Hunter’s Room, the Poet’s Room or the Golfers’ room, yet despite its size it still retains a homely, friendly ambience, something which can also be attributed to the warmness of the staff and owners, and it is popular with locals and visitors alike. During the winter I can recommend one of the tables next to the wood burner, whilst in the summer a table on the terrace looking over at the magnificent views, is the place to be. 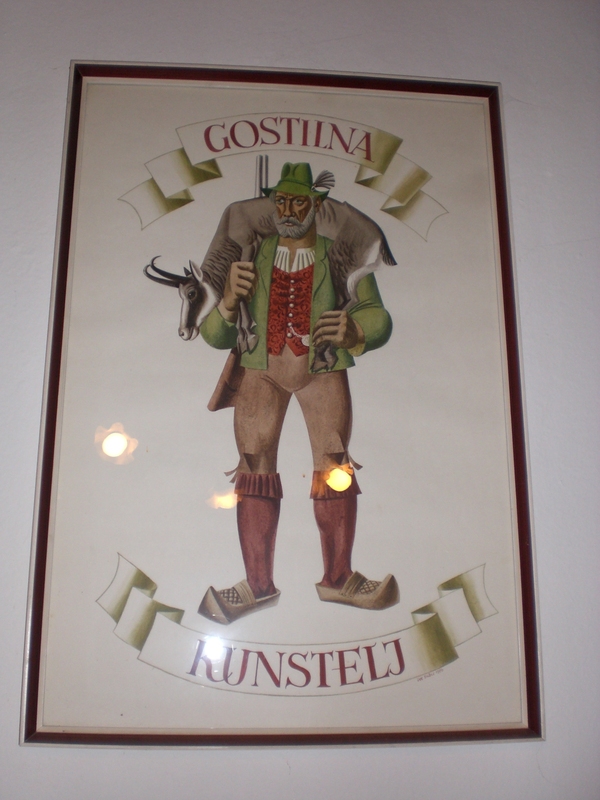 Gostilna Kunstelj is also a favourite place for group celebrations and events such as wedding receptions, anniversaries, team building, themed events, cookery events and more; it has two halls and a wine cellar which can be adapted to cater for a wide variety of functions. In addition to the restaurant, there are also 10 guest rooms, each individually and tastefully furnished and, of course, complete with those jaw-dropping views. Bikes are available to hire and its just a quick 2 minute walk to the Radovljica Tourist Information office where you can find a whole wealth of information, maps etc. of the town and surrounding areas. * Herb curd cheese, from the Podjed dairy in nearby Olševek, with wholemeal bread with chocolate pieces – Gorenjka chocolate from the factory in Lesce. 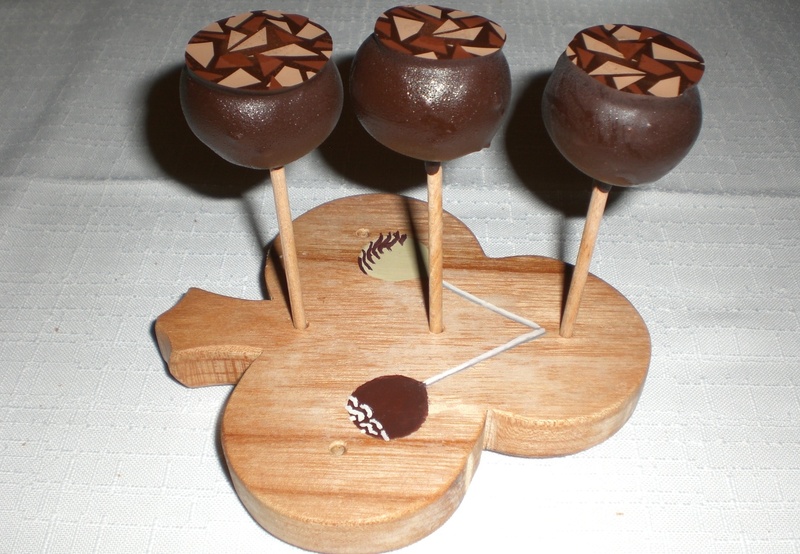 Mmm, grizike, otherwise known as cake-pops, I must confess that these are one of my favourite cakes around, although one is never enough so its just as well that they produce a range of 3; white, milk and dark chocolate, each with a different flavoured centre. 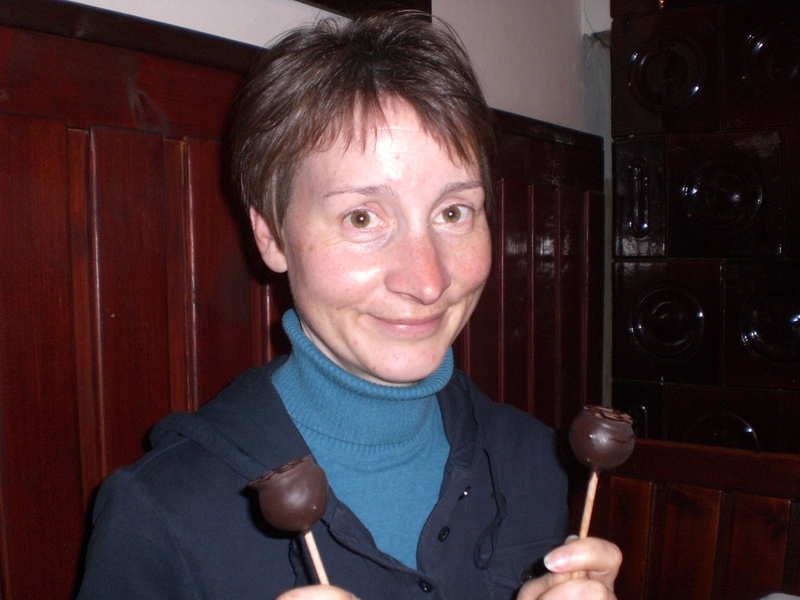 Though cake-pops are nothing new in the US and UK, they are still something of a novelty here and the Gostilna Kunstelj grizike have been trademarked and they were, almost literally, flying off the shelves at last weekend’s Chocolate Festival. I will certainly be going back for more, again, and again…….. How lucky then that I live just a stone’s throw away. 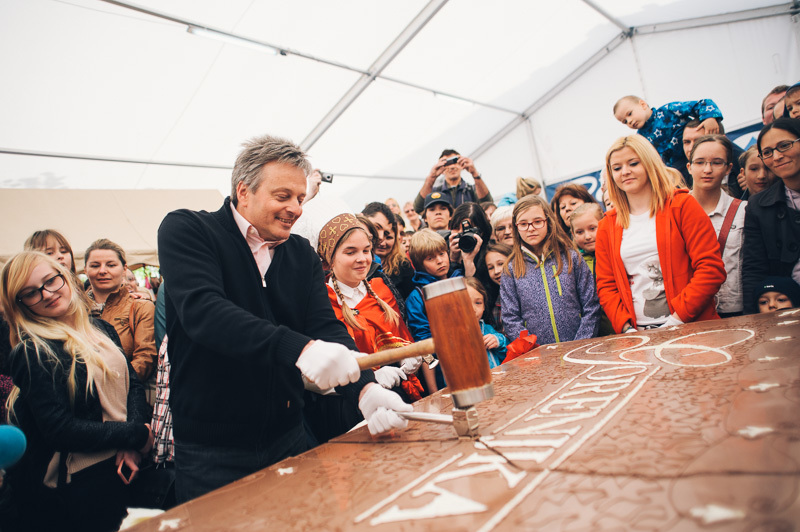 The long awaited 3rd Chocolate Festival took place in Radovljica this weekend. Since its beginnings in 2012, the Festival has been going from strength-to-strength with the number of exhibitors increasing every year as they get wind of the popularity of the event and want to be a part of the success. This year the number of visitors also exceeded all expectations with more than 35,000 visitors over the two day event and over 80,000 tasting coupons purchased which, doing the maths, makes for an awful lot of chocolate having been consumed and just goes to prove, as if proof were needed, how popular chocolate really is, and that I’m not alone in my cravings for the stuff! One thing is for sure – this event is here to stay on the Radovljica Events Calendar and looks set to just keep getting bigger and better every year. In addition to the exhibitors, there were plenty of activities going on for both adults and children including a Chocolate, Cigars and Cognac workshop (strictly adults only! ), a Chocolate Fashion Show, the Three Chefs’ Cooking Show – featuring three of Slovenia’s top chefs, the 92kg giant Gorenjka chocolate bar – shared out among visitors, chocolate body painting and so much more…. 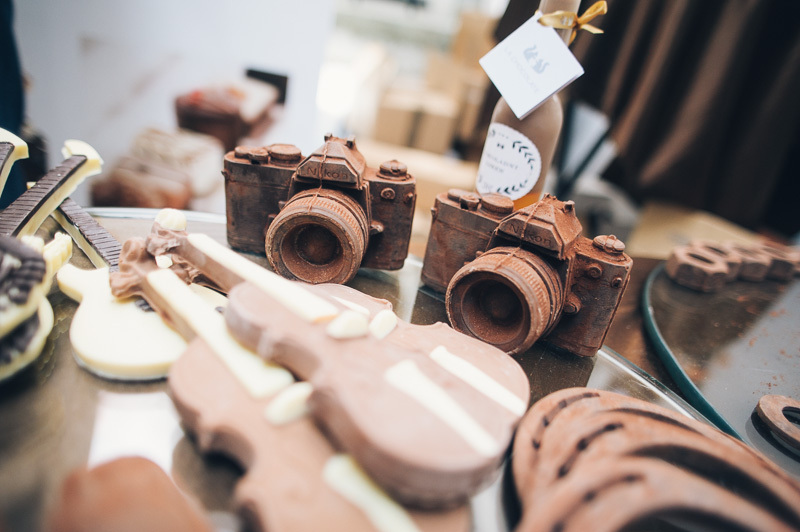 * Everything imaginable made out of chocolate – even cameras and violins. *A familiar face sampling a treat or two! I don’t know about you, but when I’m planning to visit somewhere on holiday I always like to see if there are any special events happening that coincide with my visit such as markets, festivals, fairs or concerts. I find these type of events are a great way to get a feel for the local area, taste the local food, mingle with the locals, savour the atmosphere and perhaps find out a few insider snippets too. I also like to do this at home to so I have a few events and things planned in the diary, things to look forward to. The best way to do this these days is of course by scouring the net for information and usually the local tourist information website is the best place to start. However, since I entered the realm of blogging myself, I have also noticed how popular a source of information blogs have become these days, particularly those written by locals that offer an insider’s perspective into life in their city/town/village as well as providing invaluable information about where to go, what to see and do etc. 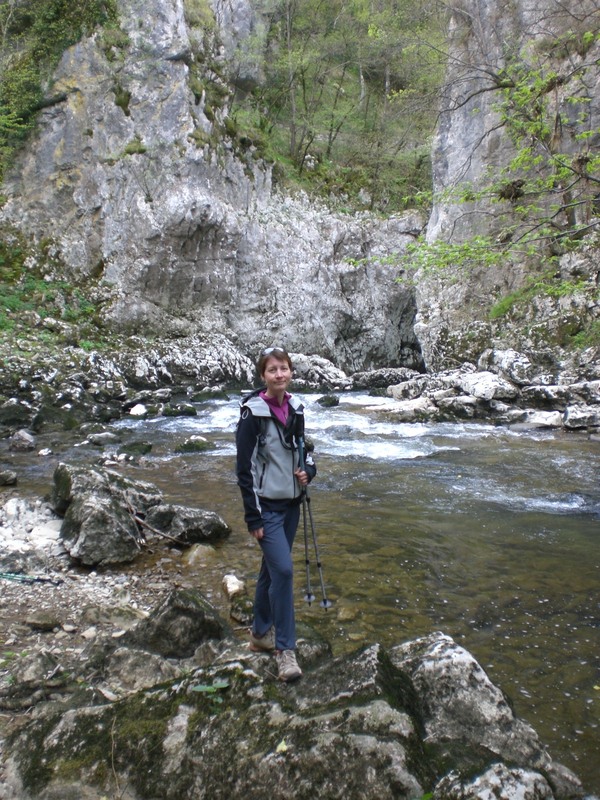 I hope through this blog about my (adopted) home town of Radovljica, I am also able to provide such information and inspiration for potential visitors, both from Slovenia and abroad. My parents visited from the UK last weekend and, since my father is also a chocolate lover, their visit was well-timed. It was, as it always is, lovely to spend time with them, especially as our time together these days is limited to just a few weekends, either here or in the UK, a few times a year so it makes it even more precious and we certainly packed a lot into the weekend including dinner at Gostilna Kunstelj, to taste their special chocolated-themed menu, two visits to the Chocolate Festival (one was never going to be enough! 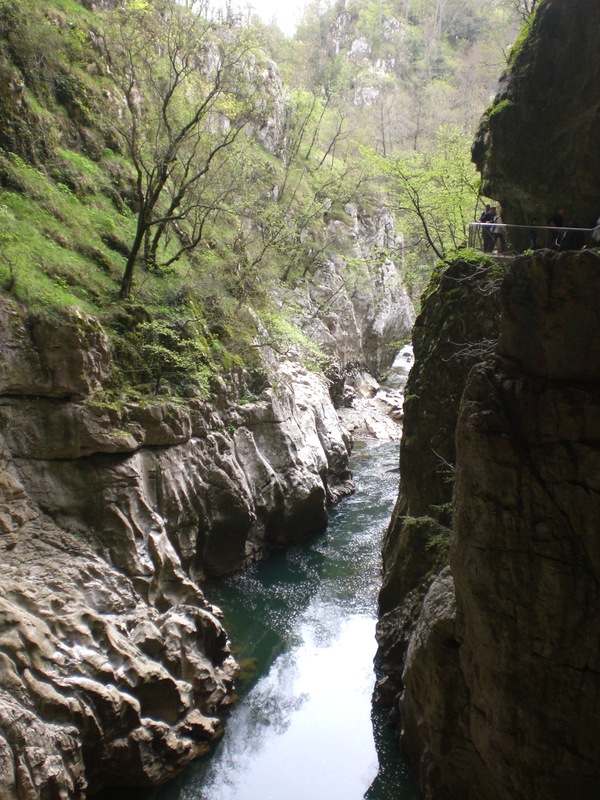 ), a walk on the circular Kriva Jelka path and a visit to the UNESCO listed Skocjan Caves for the annual Pohod ob ponoru reke Reke (Walk along the river River sinkhole – that’s not a typo, the actual name of the river is ‘The river River‘!). 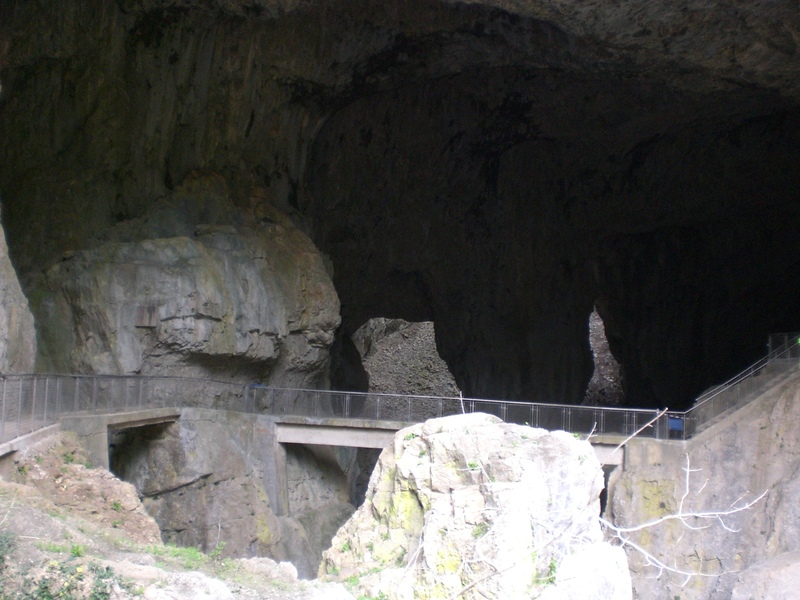 More about Gostilna Kunstelj and the Skocjan Caves in the coming days…. In the meantime I’m pleased to be the bearer of good news that the Kriva Jelka path is once again walkable in its entirety, without the need for too much tree ducking and diving – something that has become a fairly regular necessity since the devastation of February’s ice-storm bought down so many trees throughout the country. 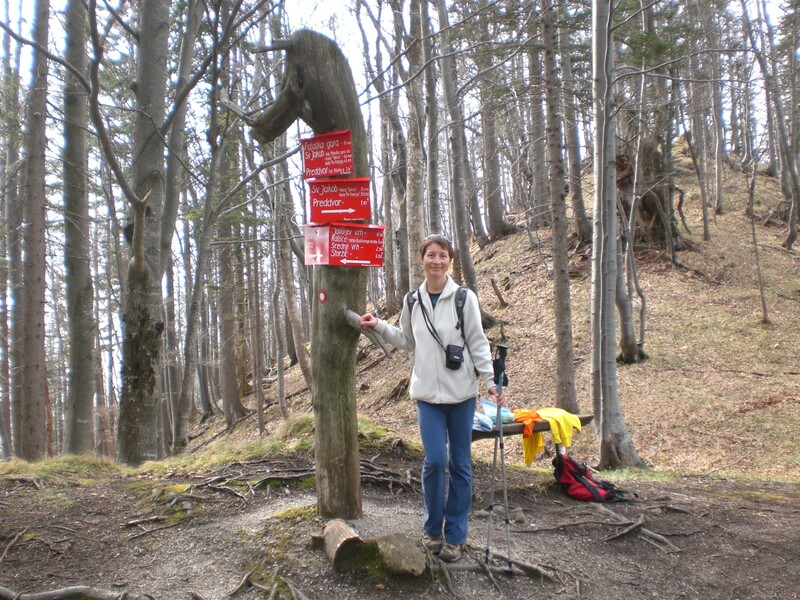 Since the path runs almost entirely through the Udin Boršt forest, I was wondering if it would be passable but a quick email to the President of the local Tourist Association confirmed that the path had been in the main cleared, (a superhuman feat considering the scale of the work required). 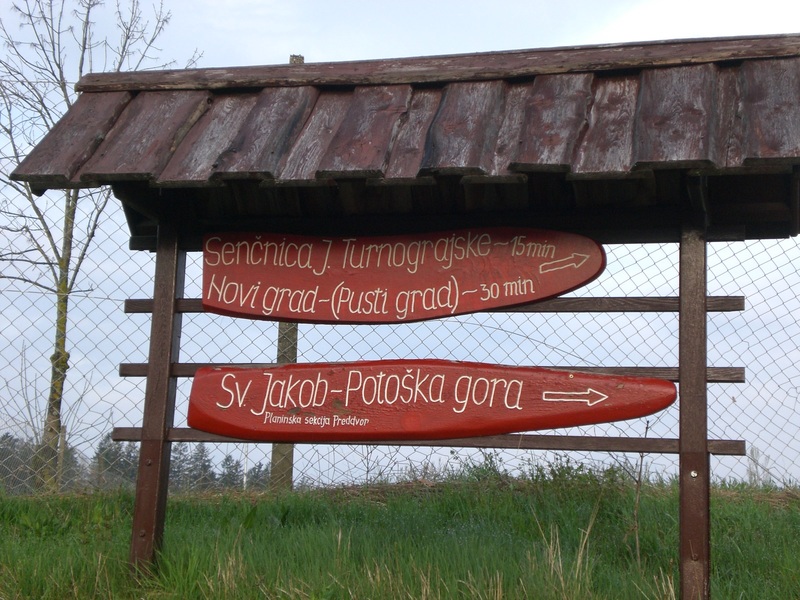 I wrote in greater detail about this path last autumn (https://adeleinslovenia.wordpress.com/2013/09/16/the-kriva-jelka-path-and-sweet-treats-ahead/). There is also currently a colourful Easter themed exhibition in the Manor House in the village of Spodnje Duplje, created by students from the nearby Biotechnical Centre in Naklo, which makes an ideal stopping-off point as the path goes literally past the door of this handsome building. 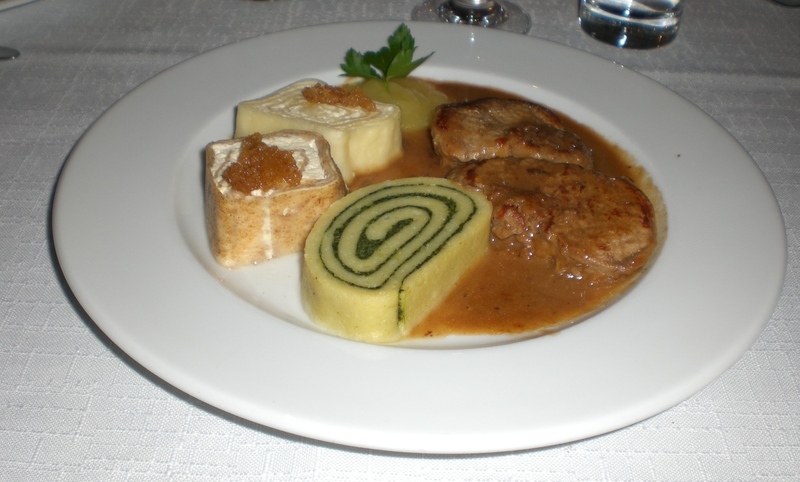 In the seven years since I’ve been living here, the range and quality of the cuisine on offer in Radovljica, and the surrounding towns and villages collectively known as Radol’ca, has always been solid, based on traditional, plentiful and flavourful food. However, since the creation of the Taste Radol’ca project last year, together with the opening of new venues such as Vila Podvin and Chateau Lambergh, the choice, quality and innovation of the cuisine on offer has rocketed and with new ideas and ventures being added to the events calendar all the time, its certainly an exciting time to be a foodie, as I am, in the Radol’ca area. The Taste Radol’ca collaboration has certainly bought strength in numbers, led to new initiatives and inspired creative juices among the already talented chefs who work in the area. To this end it has meant all the restaurants involved have upped their game and are offering food which deserves to be shouted about. And since they are so modest, I decided to offer a gentle nudge and to be the one to begin the shouting! 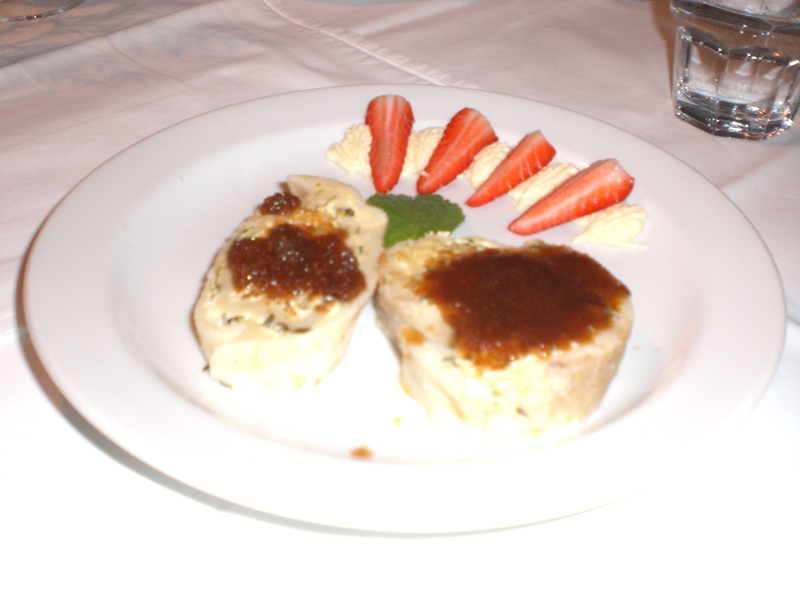 It is with this in mind that I will be adding a new section to my blog entitled ‘Taste Radol’ca’ where I will write a series of shorter blogs about the restaurants I have visited and will also be able to keep readers updated about forthcoming events. I will also post more information and updates on my Adele in Slovenia Facebook page (use the ‘LIKE’ button opposite to stay up-to-date). So it seemed fitting to start this week with the Slovene institution that is Lectar Inn. The family run Lectar inn, which is right in the heart of the medieval old town of Radovljica, comprises a restaurant, live gingerbread museum and accommodation (incidently some of my family have stayed there in the past when visiting me, and were more than satisfied with the accommodation, service and food). The Inn has a tradition dating back over 180 years and a justifiably proud reputation which attracts locals, visitors from across the land and tourists. 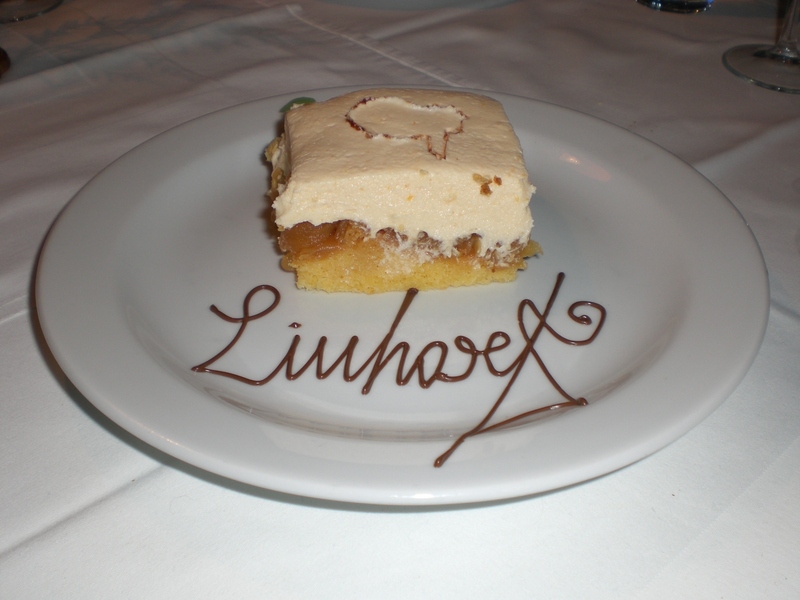 The waiting staff are dressed in tradition clothing, the food hearty, traditional and locally sourced. and the atmosphere always warm and never stuffy. In conjunction with the Radovljica Chocolate Festival (http://www.festival-cokolade.si/), which will take place this weekend on Saturday 12th and Sunday 13th April, the restaurants in the Taste Radol’ca project are offering special chocolated-themed menus all this week and weekend so obviously, being the chocoholic that I am, it was with no hesitation that I plumped for that option without so much as the need to look at the menu. All the restaurants involved are offering 3 courses for just 13 euros. So if you are planning on visiting the Festival this weekend, live in, or near the area, or planning a visit, Lectar Inn should be on your list be it just for a drink, a hearty meal, a visit to the Gingerbread Museum or to stay overnight. Oops, my ‘mini-blog’ isn’t quite as ‘mini’ as I intended, more of a tome really, just too much exciting stuff to write about! Until next time…….